The more I look at the blue sky through the bare branches of the acacia tree, which sits outside our kitchen window, the more the picture changes in front of my eyes. To start with, the dominant colour is blue, but as my eyes rest longer I start to see the branches as if they are painted in lines of grey and white, lines of light and shade. The picture I see is not of a tree on a winter’s day, a beautiful blue sky, the yellow coin-sized dustings of lichen, but a piece of abstract art. The same branches will look completely different tomorrow if the sky is cloudy, but it is not the tree that changes. Only my perception of it. On a bright day the darker lines are not only the branches themselves but their shadows. When an object blocks the light, it casts a shadow. The ‘cast shadow’ is not a solid shape, it varies in tone, the farther it is from the object, the paler it becomes. The ‘form shadow’ is the less-defined shadow on the side of the object facing away from the light. 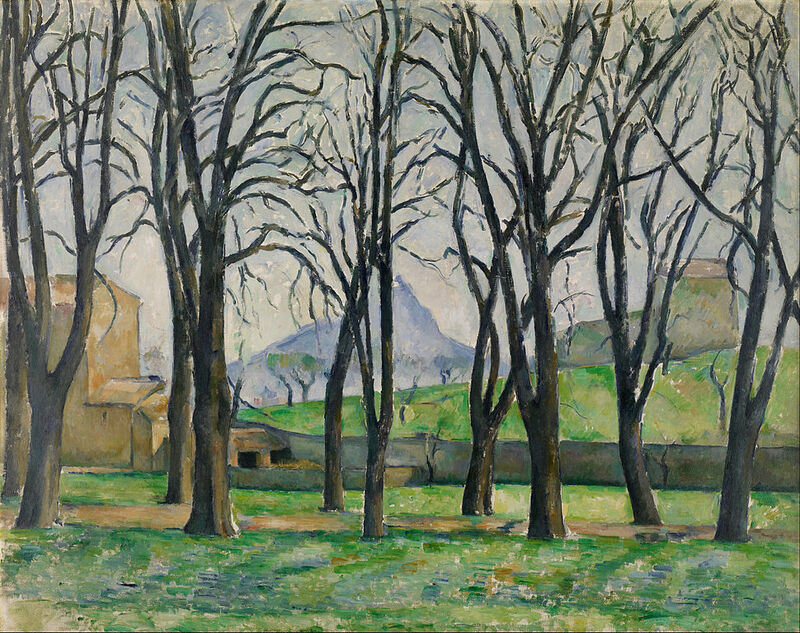 As demonstrated [below] by Paul Cézanne’s ‘Chestnut Trees at Jas de Bouffan’. Read this fascinating article about the use of light and shade in art, by Sheri Doty. This entry was posted in Nature and tagged Andalucia, art, living abroad, Sandra Danby, Spain, trees on December 4, 2015 by sandradan1. Nature is its own art. Great shots!